Yesterday’s signals were not triggered, as none of the levels were reached. Short entry following a bearish price action reversal upon the next touch of 1.0110. Long entry following a bullish price action reversal upon the next touch of 1.0028 or 0.9986. I wrote yesterday the U.S. Dollar was quite strong but was not advancing very strongly here. I thought there was a weak likelihood of higher prices today if the price could get established above 1.0050. This was a good call, although the price fell back later to the level at 1.0052 which now seems to have become established as support. There is a case to be bullish as long as 1.0052 holds as the London session gets underway, but the U.S. Dollar is more mixed now, and as this pair tends not to trend, I would be more excited about a possible strong reversal at 1.0110 providing a short trade opportunity if it is reached later. 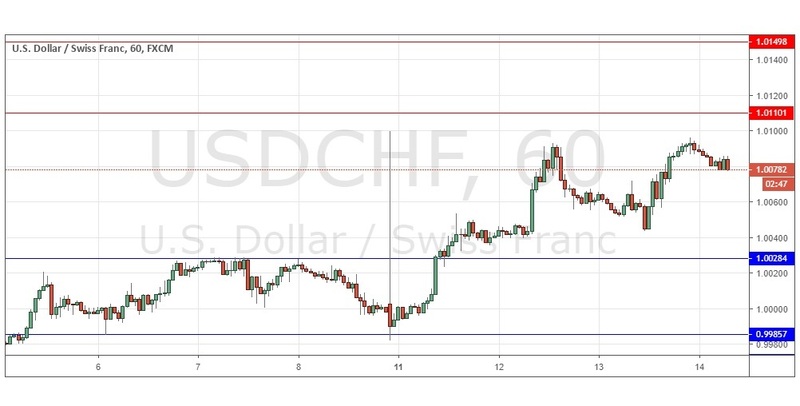 There is nothing of high importance due today regarding the CHF. Concerning the USD, there will be releases of Retail Sales and PPI data at 1:30pm London time.